Christmas in Spain wouldn’t be complete without a visit to a Christmas market. From festive and traditional to unique and designer, there is a wide range of Christmas markets across the country. 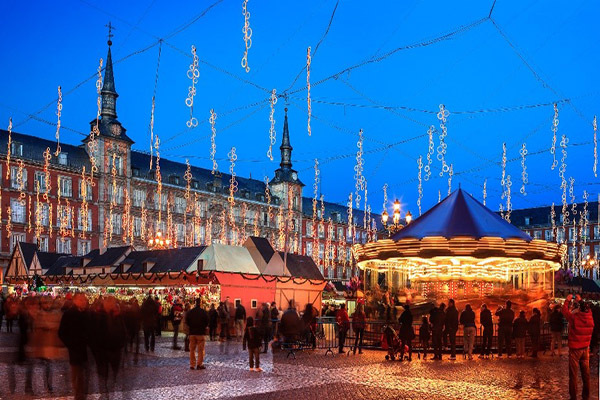 The most classic and popular Christmas market in Madrid, the Plaza Mayor Christmas market is open from mid-November right the way through until the New Year. It has more than 100 stalls, as well as a beautiful carousel and a wonderful festive atmosphere. What better place to get into the Christmas spirit than in one of the oldest and most cherished Christmas markets in the country? If you have a sweet tooth, don’t miss the chance to visit Madrid’s Feria Dulces de Navidad. Located every year in Plaza Isabel II, you will find traditional sweets and desserts sourced from all over Spain, meaning you can eat your way around the country without leaving Madrid! From turrones and polvorones to hot chocolate and fried churros, it’s certainly not one to be missed. 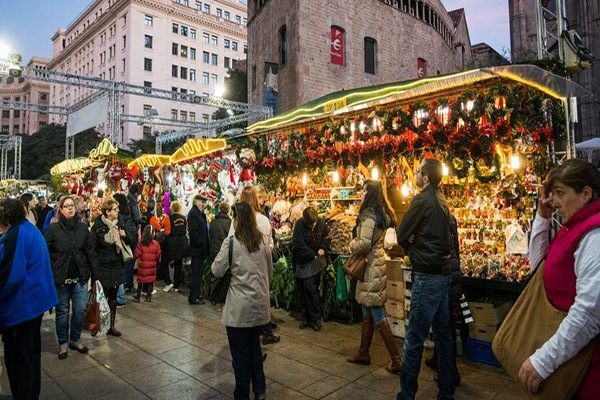 This fantastic Christmas market is set up every year around Barcelona Cathedral, beginning this year on the 30th November until 23rd December. There are approximately 300 stalls which sell anything from Christmas goods (such as decorations trees, Nativity scenes) to a variety of handmade goods (jewellery, scarves, ornaments, etc.). It’s highly recommended to visit this market twice – once during the day and once at night – so you can enjoy the different atmospheres. 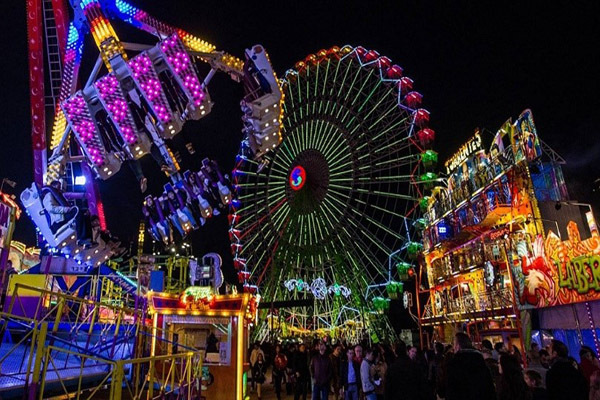 Slightly different to your traditional Christmas market, the Valencians swap hot chocolate for candyfloss at the Feria de Atracciones, which takes place 25th November-22nd January between Calle Ingeniero Manuel Soto and Avda. De Francia. It does have the usual Christmas stalls and festive music, however this amusement park features a giant Ferris wheel, bumper cars and mini rollercoasters. Perfect if you want to add some adrenaline to your Christmas holidays! 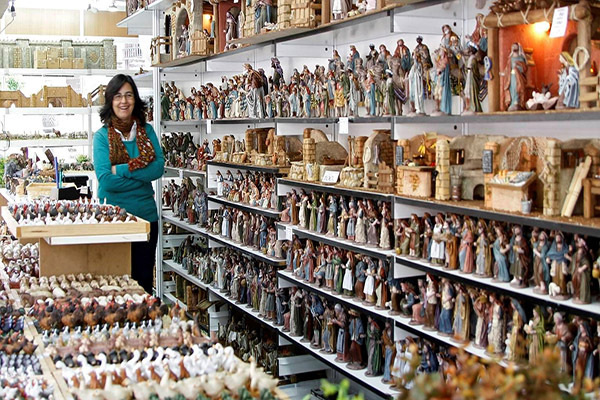 Sevilla’s Feria de Belén is unique in that it specialises solely in figurines and Nativity sets, which are known as ‘Beléns’ in Spanish. From Mary, Joseph and The Three Kings to mini market places and shepherds, there is a wide variety of these extremely delicate and intricate figurines. Located in the historic centre, near the Cathedral, it runs from November 18th to December 23rd. 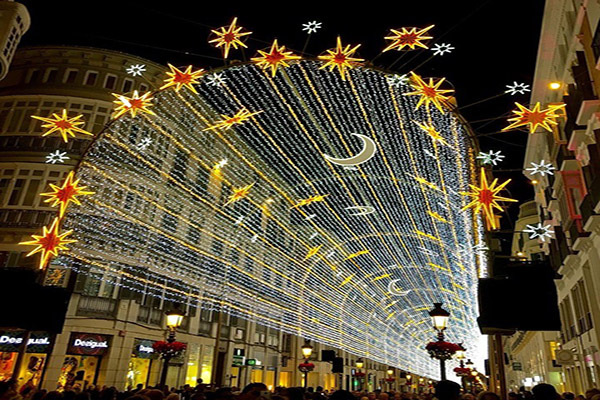 if you love Málaga’s lavish annual Christmas light displays, then you’ll be sure to love the Málaga Christmas Market. Although it is relatively new to the Christmas market scene (only 2 years old! ), it has become an extremely popular festive even, taking place from the 26th November – 10th December this year. You will find stalls selling clothes, accessories, ceramics, crafts, and antiques, as well as food trucks and activities for families and kids. 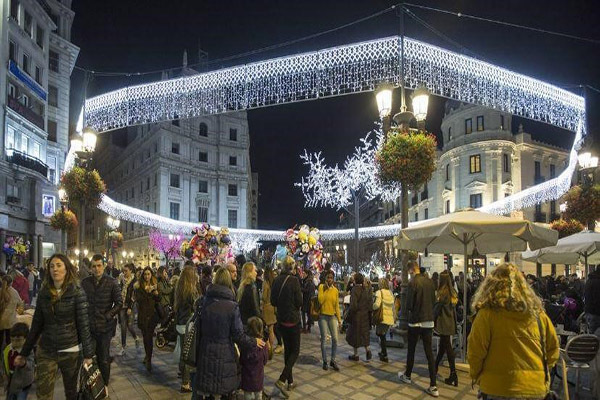 Located in the heart of the city (between Bib-Rambla and Puerta Real-Fuente de las Batallas), Granad’s Christmas market will begin on the 1st December and last until the 6th January. It will consist of more than 50 stalls with a wide variety of products where visitors can buy anything from books, plants, Christmas trees and handmade gifts, to sweets, meat, wine and other local produce. A must-see if you are in Granada in December! The 22nd December is the draw of the famous Spanish Christmas Lottery, known as ‘el gordo’. It is considered the biggest lottery in the world due to the prize money available, and Spaniards sit anxiously in front of the TV in the hope of seeing their number appear. Christmas Eve is called ‘Nochebuena’ in Spanish and is often considered as the most important family gathering of the year. People will often meet for some drinks in the early evening, then return home later on to enjoy a meal with their family. A typical Nochebuena meal would include tapas starters, fish, roast lamb or pig, and numerous traditional sweets and desserts. Although Christmas Day is not celebrated as much in Spain as it is in other parts of the world, it is a national holiday and is considered a day for relaxing, and children usually receive a small gift from Santa Claus. New Year’s Eve is known as ‘Nochevieja’ and is one of the biggest celebrations of the whole year. Across the country there are street parties, events in hotels and clubs everywhere. A famous Spanish New Year’s Eve tradition is to eat 12 grapes at midnight (one on each stroke of the clock) to bring good luck for the New Year. Afterwards, thousands of people will go out to party into the night. 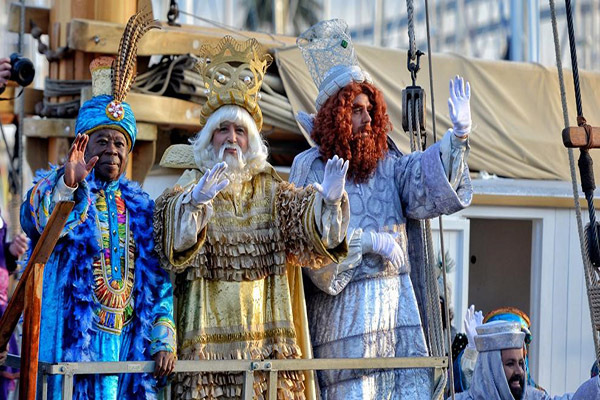 The 5th of January is when the Three Kings - Melchor, Gaspar, and Baltasar – parade through the cities and towns of Spain to symbolise the arrival of the three wise men when Jesus was born. The processions are spectacular, with giant floats carrying children’s characters as well as the Kings who throw sweets into the crowd. Then, on the 6th of January, the children wake up to find all of the presents that the Kings have left for them. This day is known as ‘el día de los Reyes Magos’ and is the most important day of the Spanish Christmas season. Despite all of the important dates and all of the wonderful Christmas markets, there are still plenty of festive activities and places to visit, should you have some free time. 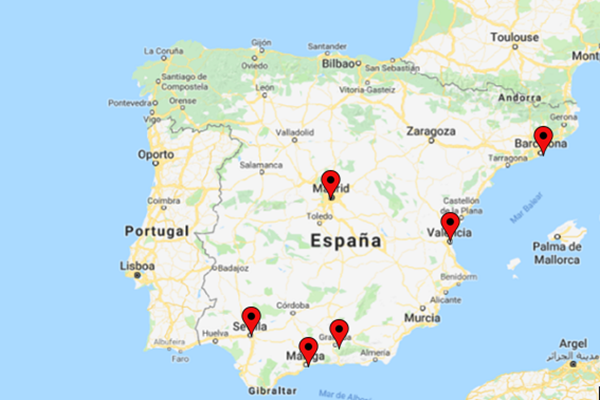 Nativity Scenes – take a look at one of the many living Nativity scenes which you find in many cities and towns around Spain. Oxen, mules, shepherds’ boys, Mary, Joseph and even the Baby Jesus himself will make you feel like you are taking a trip back in time. Shopping – Spain is one of Europe’s best shopping locations all year round, but there is truly no better place to do your Christmas shopping. Why? Tons of unique markets with one-of-a-kind products, extended store opening hours, and, of course, the sales that begin in the New Year. 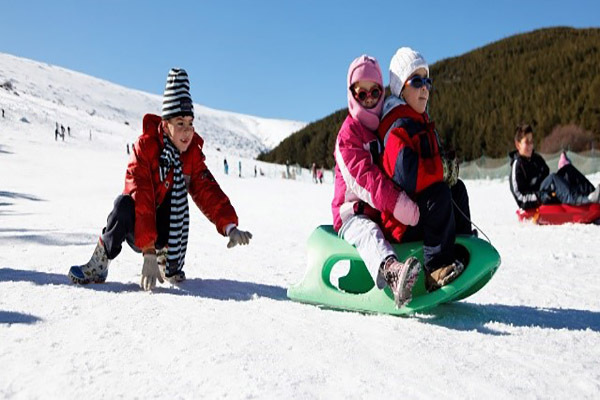 Skiing – for an authentic White Christmas, go skiing at any of Spain’s ski resorts. For example, Sierra Nevada. Something sunnier – would you prefer better weather? Spend Christmas at the Canary Islands, the warmest part of Spain during the winter months. You could even spend some time on the beach! If you would like to know more about our Christmas packages at across spain, please do not hesitate to contact us!